The Tourist is an 84mm equivalent of the Spartan 91mm model. The name "Tourist" is a recent identifier attached to this toolset. 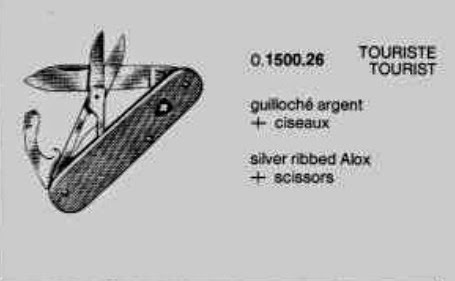 On some old catalogs (SMICO 1980s) refer to the name "Tourist" referred to a ribbed alox 84mm with main blade, scissors and combo tool with the old shield (item number: 0.1500.26). 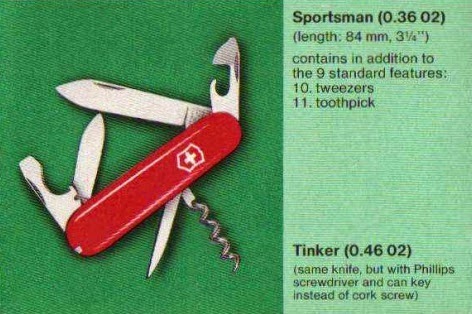 This toolset was called the Sportsman in the 1980s (SMKW 1989 Holiday catalog) with item number 0.3602). This particular model is from the 1960s, when bails were used instead of key rings. Also sports the clip point small blade. It has the "+PAT" stamp in the can opener. Victoria tang stamp in the main blade. Awl with no eye and five-turn fluted corkscrew. This is the "Tourist" 84mm ribbed alox which is now referred to as Voyageur in sakwiki.com. This is the Sportsman, the previous name assigned to the current Tourist toolset during the 1980s.